When Hillary Clinton described half of Donald Trump's supporters as "deplorables," they railed against her. Now, Trump has characterized them in a similarly unflattering light. Trump said his supporters were "vicious, violent, nasty, and mean" while speaking at his victory tour rally in Orlando, Florida, on Friday. But isn't being violent, nasty, mean, and vicious essentially the definition of deplorable? 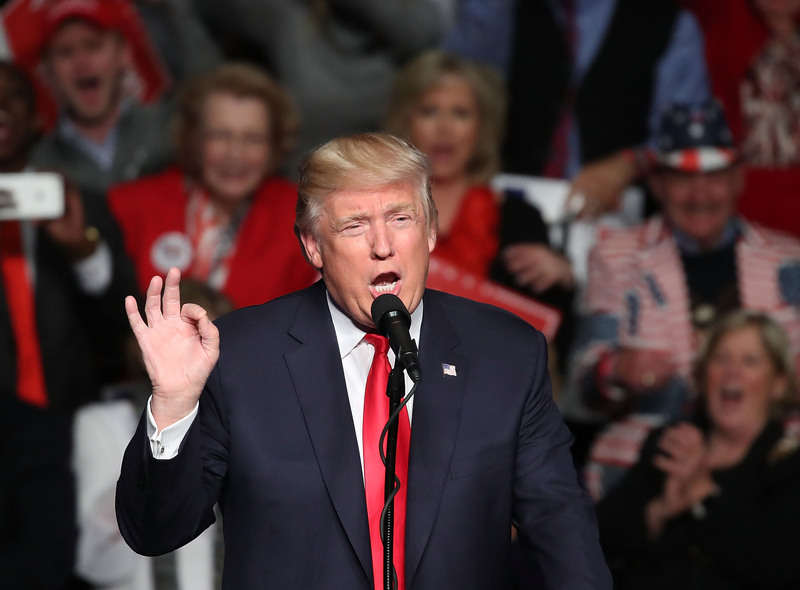 While Trump repeatedly downplayed his supporters' violent outbursts on the campaign trail, the president-elect admitted his supporters had been, well, deplorable during the election. "You people were vicious, violent, screaming, 'Where's the wall? We want the wall!' Screaming, 'Prison! Lock her up!'" Trump said. "I mean, you are going crazy. I mean, you were nasty and mean and vicious and you wanted to win, right?" He went on to praise his supporters for being more "mellow" now that they'd won. "Now you’re laid-back, you're cool, you're mellow, right? You're basking in the glory of victory," he said. While Trump supporters may be open to being deemed "vicious, violent, mean, and nasty" by their leader, they certainly weren't open to Clinton calling them such in fewer words. In fact, Trump's team helped elevate his supporters' outrage with statements alleging Clinton had "revealed her true contempt for everyday Americans" in September when she said, "You know, to just be grossly generalistic, you could put half of Trump's supporters into what I call the 'basket of deplorables.'" Yet I have to wonder how being deplorable differs much from being "vicious, violent, mean, and nasty." Trump's most recent comments are also in stark contrast to some he'd made earlier in the year amid allegations he was inciting violence among his supporters (namely, when he encouraged them to "knock the crap" out of protesters and offered to cover any legal fees they incurred due to assault charges). In March, for example, Trump denied there had ever been any violence at his campaign rallies and characterized them as "love-fests." "There's no violence," Trump said, as Time reported. "There's love-fests. These are love-fests." Perhaps Trump's willingness to categorize his supporters as "vicious, violent, nasty, and mean" now is due merely to his desire to walk back on his promise to prosecute Clinton. Or perhaps he's only just now been able to get caught up on reports of one of his supporters punching a protester in the face or these nine different violent attacks on women. Either way, it's nice to see Trump and Clinton finally agree on something — that his supporters were deplorable.